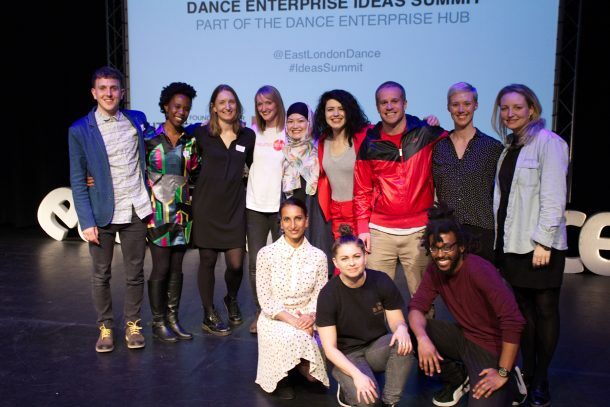 Six fund winners and four in-kind support winners were announced at the Dance Enterprise Ideas Summit on Friday 31 March. Bursaries totalling more than £20,000 were awarded to six outstanding dance creatives, with a further four projects offered in-kind support at the 2017 Dance Enterprise Ideas Summit, a day-long event on Friday 31 March, hosted by East London Dance at Stratford Circus Arts Centre. The Dance Enterprise Ideas Summit is the second annual event offering artists, producers, venues and organisations from East London and beyond the opportunity to share and exchange enterprising ideas in dance. The 2017 Dance Enterprise Ideas Fund shortlist was: Carolina Adewale, Rashmi Becker (Step Change Studios), Poppy Burton-Morgan (Metta Theatre), Jorge Crecis (SQx / Jorge Crecis), Charlene Davies (Hoop Hop), Sharon Davis (JazzMAD – Jazz Music And Dance Co.), Eleesha Drennan (Eleesha Drennan Dance), Mars El Brogy (Salah El Brogy Company), Joe Garbett (Joe Garbett Dance), Trine Garrett & Camila França ([Foreign Affairs]), Charlie Lee George (Dark Island Dance), Maria da Luz Ghoumrassi (Da Luz Dance Company), Haseeb Chilly Hearn (Rain Crew), Lisa Hood (Avant Garde Dance Company), Kendra Horsburgh (BirdGang Dance Company), Emma Houston (Emma Houston Dance Company), Kwesi Johnson (The Cultural Assembly), Emily Labhart (Dancehall Origins), Mariana Lucia Marquez & Emma Zangs (Marquez&Zangs / Metaspeech), Jo Rhodes, Tom Rowlands-Rees (Cinema Kpatakpata) and Jessica Wright & Morgann Runacre-Temple (Jess and Morgs Films).